Every now and then a book seizes the attention of the world. "If I Did It" is one of them. In 1994, Nicole Brown Simpson and Ron Goldman were brutally murdered at her home in Brentwood, California. Her former husband OJ Simpson was tried for the murder after fleeing on live TV in a Ford Bronco with a gun and thousands of dollars (and having a previous charge for domestic violence). In a dramatic criminal court case that was broadcast globally, Simpson was found not guilty to the surprise of even his friends. He later declared himself bankrupt to avoid payments in a civil judgement for wrongful death.In November 2006, the former sports and film star announced a six figure book and publicity tour in which he would reveal how he committed the murders, hypothetically. In response to widespread outrage that OJ Simpson stood to profit from these crimes, booksellers and broadcasters refused to feature the book. It was withdrawn with a public apology and all 400,000 copies were pulped. In August 2007, a Florida bankruptcy court awarded the copyright of "If I Did It" to the estate of Ron Goldman to satisfy the unpaid civil judgement, which had risen to over $38 million. As the Goldman family saw the book as the confession of the killer they had waited for, they decided to publish the originally approved text by OJ Simpson. They added their commentary to the killer s confession. 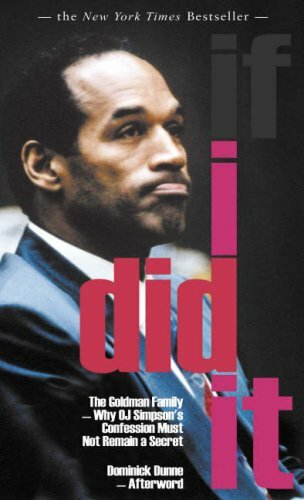 The Estate of Ron Goldman was awarded the copyright of OJ Simpson's IF I DID IT in August 2007. Kim Goldman is Ron Goldman s sister. She is the director of a youth charity. She worked on publication of this book with her father, Fred Goldman, and wrote an introduction to If I Did It. Pablo Fenjves took the interviews for IF I DID IT. He was a neighbour of Nicole Brown Simpson s and a witness at the murder trial who heard the howling of her dog Kato. His contribution was not in the original plan for the book. Dominick Dunne was given a special seat at the murder trial by Judge Ito, and attended every day for Vanity Fair. He previously won praise for his coverage of the murder trial of the Menendez brothers and that of his own daughter.